The key to a perfect Selfie? Your smile! You’ve seen kids taking them on the street, in movies theaters, by themselves and in groups. Maybe you’ve even taken a few of your own. We’re talking about a Selfie — a self-taken picture where the subject and photographer are the same person. Facebook, Instagram, Twitter and other social media platforms are full of them. 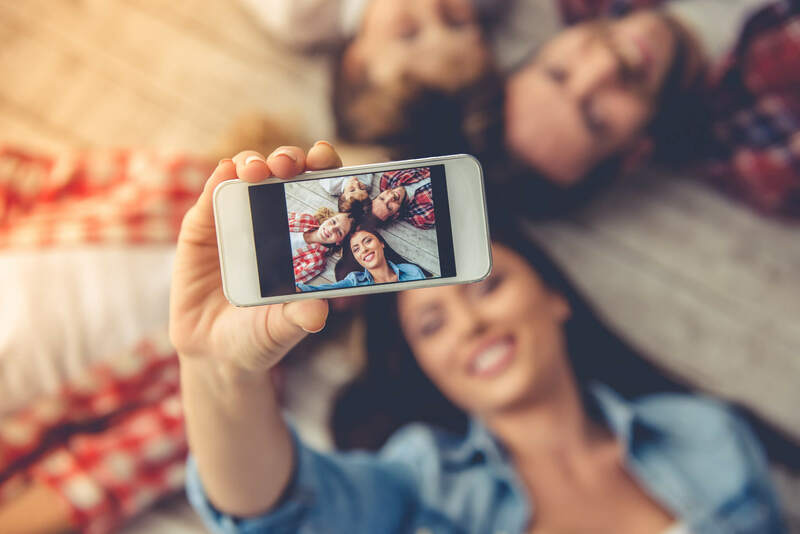 In fact, sociology experts predict that Millennials and Generation Z (those people born after 2000) will take an average of 25,000 Selfies during their lifetime. And many of them will be awful pictures. From heavy shadows to unfocused faces, blurry movement or heads out-of-frame, there are 101 ways to take a bad Selfie. However, Meyer & Johns Dental wants to share few tricks to make sure you put your best face forward while taking a photo of it. windows can cause unwanted reflections. that point to automatically adjust focus, depth and exposure. Of course, everyone knows how to do this last one. But if you feel like your smile isn’t ready for a close-up, Meyer & Johns Dental can help. From teeth whitening, to same-day crowns, to porcelain veneers, we have the right choice to make sure your smile looks great– both in-person and at arms-length! To discuss cosmetic options for your teeth, contact us or talk to Drs. Meyer or Johns at your next regular appointment or contact us to explore the options. Hate to Wait? Same Day Crowns at Meyer & Johns. Let’s face it; no one likes to wait—especially if it’s for a medical procedure. At Meyer & Johns, we do our best to address the needs of our patients in a timely manner. That’s why we are pleased to offer Same Day Crowns. To accommodate a crown, the tooth usually must be reduced in size. Then, a cast is made of the tooth for an impression, which is then sent to a special lab where the crown is made. Some cases require a temporary crown while the permanent crown is being manufactured. However, Same Day Crowns are available if one is a viable option for your needs. Same Day Crowns are most often used to restore a tooth’s function and appearance following a restorative procedure or when decay in a tooth is so advanced that portions of the tooth must be removed. Crowns look natural in appearance and are an excellent way to restore the aesthetics of discolored or stained teeth. Unlike veneers, which are typically applied to small areas, crowns are placed over the top of the tooth and are quite durable, lasting up to a decade with proper dental care and hygiene. If you have teeth that are discolored, cracked or chipped, don’t wait. Contact Meyer & Johns, today for more information on Same Day Crowns and all of our cosmetic dentistry services.